Radium, as the story goes, was Marie and Pierre Curie’s greatest triumph and discovery while reducing uranium ore, or pitchblende, into its separate elements. Discovered mere months after polonium (1898) and from the same pitchblende sample, radium was first noted by the Curies due to its faint-blue luminescence under ambient conditions – a feature not common to other radioactive elements. Radium is 2.7 million times more radioactive than comparable amounts of uranium, and is so scarce that it takes the reduction of several tons of uranium ore to produce just a single gram of radium. Because of its high radioactivity and relative scarcity, radium is generally only made available in compounds, primarily radium chloride or radium bromide. Though credited with discovery in 1898, it wasn’t until Marie Curie performed electrolysis on radium chloride that radium was first successfully isolated in 1911. Radium was also the first element to be produced synthetically in the United States via deuteron bombardment of bismuth. Dr. John Jacob Livingood accomplished this feat in the radiation laboratory at the University of California, Berkeley in 1936. Due to its luminescent properties, radium quickly became an element with industrial and commercial applications in the early 20th century. Its luminescence was placed on watch faces, aircraft instrumentation, nuclear panels, and the like. It was only after many of the human industrial applicators fell ill that radium paint was banned in the early 1960s,with cobalt, promethium, and tritium taking over its place in industry. Radium is a somewhat tragic historical footnote on scientific progress. With properties that fascinate humans on a fundamental level, radium was quickly touted as having curative powers. Radium was infused in many daily products such as toothpaste and spa water for these supposed powers, and was only banned when the link between radium and consumer products was identified as the root cause of otherwise healthy people falling ill. Radium was additionally used in a number of medical treatments in the 1920s-1930s that have since gone out of vogue. Today, only about 5 pounds of radium are produced each year, with most of the available material going towards medical research. The Curie, now a standard unit of measure of radioactivity, is based on radium’s decay. This value is equal to the number of atoms that will decay in one second for a one-gram sample of 226Ra – about 37 billion decays per second. Radium decays into radon (also radioactive) and eventually lead. Four isotopes of radium occur in nature, with an additional 21 isotopes able to be generated synthetically. 226Ra is the most abundant isotope, with a half-life of roughly 1600 years, and is a naturally-occurring product of 238U decay. Other natural isotopes of radium are produced through uranium or thorium decay, and all natural occurrences of radium are found on Earth only in uranium< ores. Radium is an S-Block, Group 2, Period 7 element. The number of electrons in each of Radium's shells is 2, 8, 18, 32, 18, 8, 2 and its electron configuration is [Rn] 7s2. The radium atom has a covalent radius of 221±2 pm and its Van der Waals radius is 283 pm. In its elemental form, CAS 7440-14-4, radium has a silvery white metallic appearance. Radium was discovered by Marie Skłodowska-Curie and her husband Pierre in 1898. In 1910, through the electrolysis of a pure radium chloride solution, radium was isolated as a pure metal by Marie Curie and André-Louis Debierne. Radium information, including properties, research, applications and other useful facts are discussed below. Scientific facts such as the atomic structure, ionization energy, abundance on Earth, conductivity and thermal properties are included. 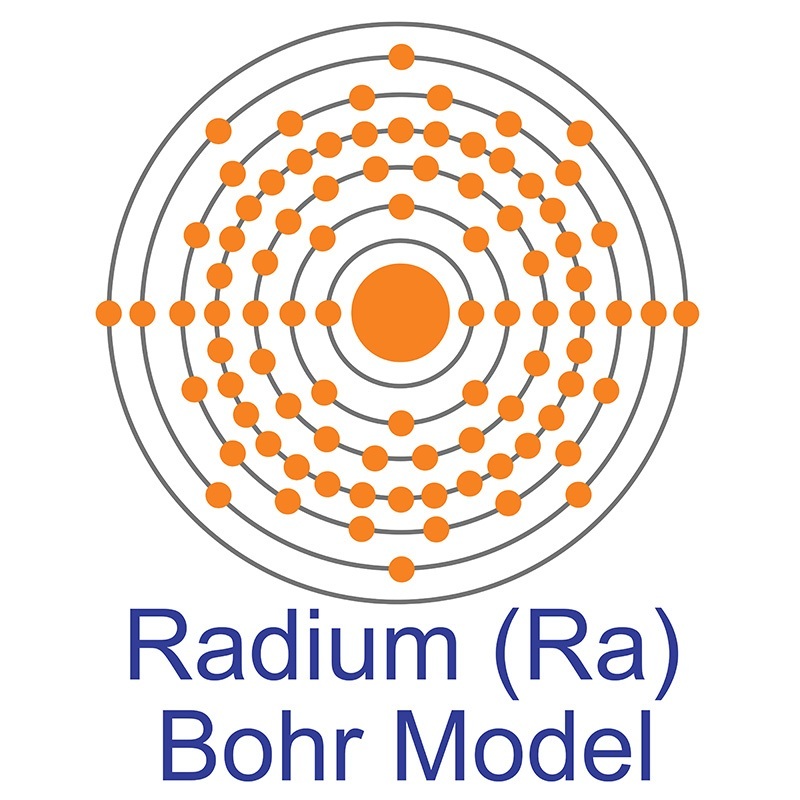 Radium (Ra) has no stable or nearly stable isotopes.